There are plenty of misconceptions when it comes to Singapore. For one that we, as a nation, are studious from topping the charts in the global education ranking. That has led from the region and beyond to believe that Singaporeans are more likely to be carrying textbooks than paperbacks. That notion has been supported in the past by our late Lee Kuan Yew who once said, “poetry is a luxury that we cannot afford” in one of his speeches to students at the National University of Singapore in 1968. Although a few students might have diverted their attention to other subjects, our love for poetry and literature in general has never grown faint. If anything, Singapore has become more receptive and appreciative of literature and there are plenty of festivals throughout the year celebrating the written word. If you are looking to open your mind and seek out the forbidden fruit of literature, there are plenty of bookstores in Singapore in which you can do so. Aside from the main retailers like Kinokuniya, Times and Popular Bookstore, there are a few other independent bookstores that are rising in popularity. Singapore is the perfect place for you literature lovers as well! Even though Epigram Books does not have a physical store, the literature offerings from this local publisher can be found at flea markets almost every weekend. If you are looking for a particular Singapore literature, you will find that Epigram Books is nothing short of options and they have championed local titles and local writers since 1991. Under its stable of offerings are a number of award-winning titles including multiple wins under the Singapore Literature Prize and the internationally-renowned Eisner Award for the comic book, The Art Of Charlie Chan. Children are definitely not excluded from all of the literature fun since Epigram Books has published plenty of age-appropriate picture books with a local slant. This, in particular, is for anyone who loves an Instagrammable spot while shopping for their next fix of literature. Nestled within the cool neighbourhood of Tiong Bahru lies the extremely cool BooksActually, from the choice of fiction titles to the chic clientele that goes in and out the revolving door of BooksActually. Expect to see classics from J. D. Salinger to F. Scott Fitzgerald in swanky new covers sitting cheek to jowl with contemporary paperbacks from Murakami to Sally Rooney. Besides being a place to peruse books and magazines, BooksActually is also a meeting point for the many events of the literary scene. Soak in the atmosphere, bring some spending cash and sit in on a poetry reading. 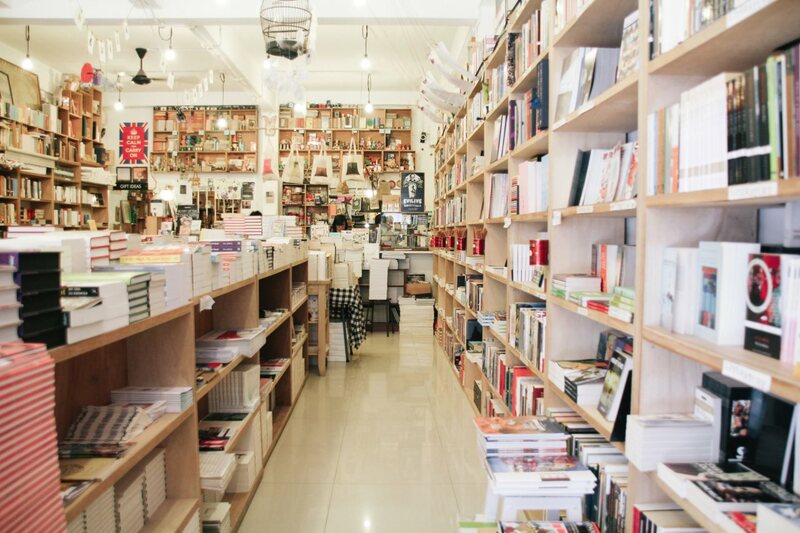 Just a few feet away from where BooksActually is situated at, it is worth making a stop at this bookstore. Longform fiction titles are not for everyone and if you go weak in the knees for illustration and picture books, then Woods in the Books would be the perfect place to while your afternoon at. Decorated with a little bit of fantasy, the whimsical bookstore carries plenty of quirky graphic novels with an indie sentiment to them. Be mesmerised by the books on offer from The Little Prince in an interactive pop-up version to favourites like Where the Wild Things Are. Part of the art collective who loves collecting graphic designing manuals or art journals? You will feel just at home at Basheer Graphic Books with the other art types browsing the different publications that the bookstore stocks up on. Within this mega stall at Bras Basah, you will find a range of obscure titles and magazines imported from other regions that would appeal to your interest, be it in fashion, animation, design, architecture or culture. Can’t spot a regular title that you frequent? Reach out to them and the friendly staff at the bookstore would be more than happy to bring it in for you without much of a hassle. What I love about bookstores is when they try to create a conducive environment with a little sprig of creativity. At Littered With Books, it is all about the amusing and the charming within the bookstore that goes across two levels in a shophouse. Across the four walls and in every nook and cranny, you will see interesting pop-ups and fun ways to discover new books. Something that you should look out for is the selection of carefully curated book bags with their contents kept secret. It makes for a fun way to uncover new authors that you would have never come in contact with. In addition to these few independent bookstores, there are plenty other options to choose from, even those that peddle second-handed titles if it tickles your fancy. Singapore has a lot to offer for the literature fan and all it takes is a little bit of uncovering and searching, much like what you would do with a good book in your hands. Copyright © Immigration Solutions (Singapore) Pte Ltd. All rights reserved.